The increased exposure that grassland animals face is a daunting challenge. Not only do animals living in these flat, featureless areas have to cope with bad weather, they also have few places to hide from predators. While some grassland species have evolved physical adaptations, such as cryptic coloration, many of the adaptations exhibited are behavioral, such as the development of herding behavior. Animals living in the forest must maneuver around innumerable objects. Forest animals rarely reach top speed when running; so, it is more important to be agile than fast. This is not the case in grasslands, where many animals -- predators and prey alike -- are capable of reaching incredible speeds. Thomson’s gazelles (Gazella thomsonii) and other ungulates -- the swiftest of which can barely exceed 40 miles per hour -- must evade cheetahs, which reach 65 miles per hour or more for brief periods. Lacking trees, birds that live in grasslands must nest on or under the ground. Most grassland bird species try to hide their eggs as much as possible, depositing them in dense vegetation. Killdeer (Charadrius vociferous) protect their eggs and young from predators by engaging into broken-wing display, intened to draw predators away from the nest. Burrowing owls (Athene cunicularia) steal a convenient burrow, or construct their own in which they deposit 2 to 12 eggs. Lacking trees, rocks or other structures to hide behind, grassland animals have often evolved highly effective camouflage, which allows them to hide while in plain sight. Most gazelles, cattle and antelopes are clad in colors that match the grass and surroundings of their wide-open habitats. Predators like tigers (Panthera tigris) use their orange-and-black pattern to hide in the grass and ambush their prey. 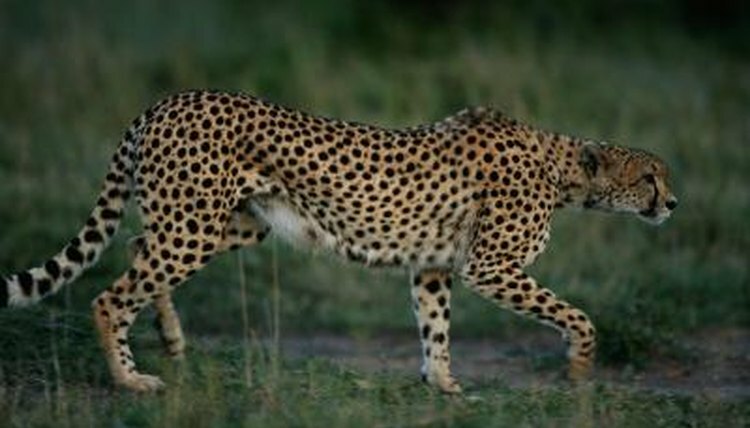 Cheetahs have adapted to grasslands somewhat differently, using a spotted pattern to conceal themselves. Herbivores of large grasslands must evade the attention of a variety of medium to large predators. Some species have become social, and form large aggregations -- sometimes composed of many different species. By grazing, drinking and sleeping in the company of many others, gazelles (Gazella sp.) and impala (Aepyceros melampus), increase the chances that one of the herd’s members will detect a predator and alert the rest of the group. Lacking the protection of trees, animals living in grasslands must cope with extreme weather and temperatures that accompany the exposed habitat. To do so, many species dig tunnels or burrows that provide shelter from poor weather, and relief from temperature extremes. Many rodents are excellent diggers, and create elaborate tunnels; in the case of prairie dogs (Cynomys sp.) these burrows combine to form complex tunnel networks, with multiple entrances and exits. In addition to sheltering animals from the climate, the development of burrowing behavior affords grassland animals some protection from predators. Grasslands often harbor plentiful rodents and insects, and represent potentially productive prowling grounds for local owls. While many owls live in forests, some have adapted to live near and hunt in grasslands. Owls in forests often hunt by scanning the ground while resting on a perch in the forest; those that adapt to grassland habitats tend to glide a few feet over the ground before diving onto located prey. The barn owl (Tyto alba) provides a great example of this phenomenon, though they still tend to roost and nest in covered locations.